Suillus granulatus mushrooms, colloquially referred to as the “weeping” or “granulated” bolete. When I was a young girl, my grandmother and I would relive one of her favorite experiences from her childhood in Poland: picking wild mushrooms for krupnik, the Polish mushroom barley soup. We woke up before dawn and drove to the pine forests surrounding Jerusalem. We arrived at the forest just as dawn broke. The majestic pine trees became visible with the pink light of early morning. The crisp air was infused with the aroma of the trees. As we started hiking, the dry pine needles crunched underfoot. The type of wild mushroom we picked is called Suillus granulatus, colloquially referred to as the “weeping” or “granulated” bolete. These mushrooms have a symbiotic relationship with the pine trees: The mushrooms extract nutrients from the roots of the trees. In exchange, they improve the soil so that the trees have enough water and nutrients. I learned to identify the weeping boletes by looking for mushrooms with a large brown cap. I would check the underside of the cap to make sure that it was a golden color. We spent a couple of hours filling a large basket with the mushrooms we found. We stopped when we had picked enough mushrooms for our needs. We knew that other people would like to have this adventure just as much as we did, and we made sure to leave some mushrooms for them too. We took our fungi back home to prepare krupnik. Weeping boletes taste like Portobello mushrooms. Their strong, earthy flavor is the perfect complement for barley. After a vigorous hike in the cold, and the seemingly endless wait in a home filled with delicious smells, we finally got to eat the krupnik. It was warm, creamy, and delicious; the perfect taste of the Old Country. 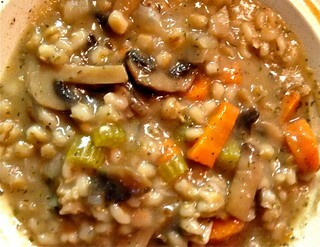 Add the onion, garlic, mushrooms, carrots, celery, parsley roots, and barley. Saute over medium heat for about 20 minutes. Sprinkle the flour into the pot, and mix it in. Add the vegetable broth, and bring to a boil. Lower the heat to medium, and simmer the soup for 40 minutes. Add the parsley and dill.